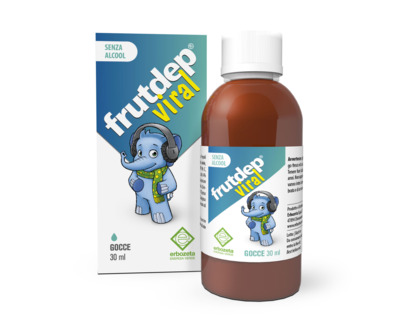 FRUTDEP® VIRAL is a dietary supplement based on Propolis and herbal extracts. Echinacea favour the natural immune system. Grindelia favours the natural function of the upper respiratory tract. Hedge mustard and Eucalyptus perform a lenitive and emollient action. Furthermore, Eucalyptus is useful for its balsamic effect. Propolis, Dog Rose, Echinacea, Erisimo, Hedge mustard, Gumweed, Thyme, Eucalyptus. Take 25 drops three times a day, pure or in a small amount of water, before the main meals.